When Will the 2012 Vintage be For Sale? Question from Maureen: If it’s harvest time now, when will the wine be for sale? Reply: Hi, Maureen. Thanks for writing! The short answer is anywhere from this November through up to as many as five years from now, depending upon the style. The thing is that making wine doesn’t take much time at all. Excluding some very small categories of wine, reds usually ferment dry within a week, or so, and whites may take up to a month. So, it’s a matter of whether or not the wine needs to age. The fastest wine to hit the market is Beaujolais Nouveau. This is a light red wine that’s made from Gamay grapes in the Beaujolais region of France, in the southern part of Burgundy. 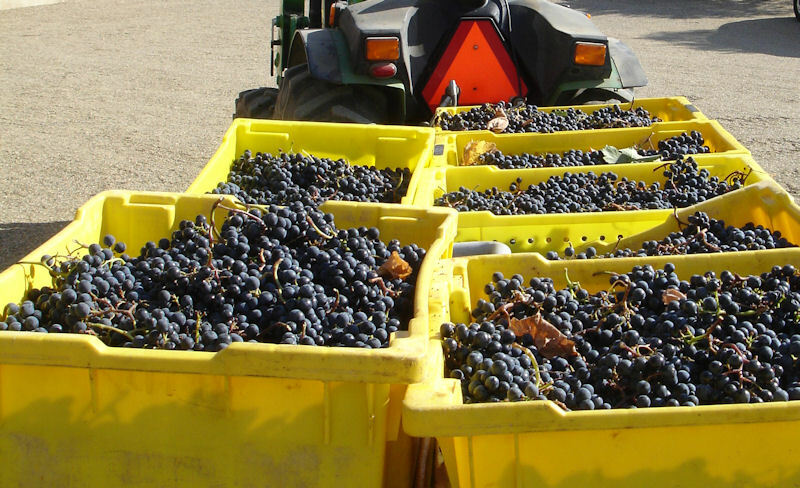 They harvest the grapes in September and go into high gear getting it fermented, cleaned up and ready for bottling before the traditional release date of the third Thursday in November. That takes an incredible amount of organization, getting it out the door that fast. Incidentally, the release date dovetails nicely with Thanksgiving. Because the wine isn’t heavy or tannic it’s quite versatile at the table. Plus, it’s fun to drink something that was fruit on the vine just weeks ago. Beaujolais Nouveau is also one of the few reds that tastes good chilled, so it’s great with summertime barbecue – if you can find it by then – they usually make just enough to sell out within a few months of release. Wineries that produce wine that doesn’t need to be aged (whites, rosés, popular price reds – most of the world’s wine, really) but aren’t under such pressure to get the wine to market will release their wine the following winter or spring, most likely, unless they have a warehouse full of the previous vintage. Fine reds, some high-end whites and dessert wines are the ones that usually need the most age. They spend months or even years in the barrel or cask, followed by some bottle age. Recently, I interviewed Maria Helm Sinskey and the current vintage of their Meritage-style blend was 2006. They hold it until they decide it’s ready for you. Leave it to the Europeans to have regulations on how long to age the wine. Chianti wine may be released on March 1st of the year following harvest. Chianti Classico (the heart of Chianti) must be aged at least seven months and Chianti Classico Riserva requires minimum of 27 months. So, it seems that even the simplest question isn’t simple. But, I hope that helps! Cheers!